The above video demonstrates a slightly more advanced multi-light system. Click “read more” to read the details of how it works, how to make it, and the source code. The general approach here is to define a point from which rays (of light) will extend, up to a defined maximum length. We extend a ray at every angle (0-360) from this point of light. We do a check with every ‘line’ of every polygon in the area and see if this ray intersects this line. 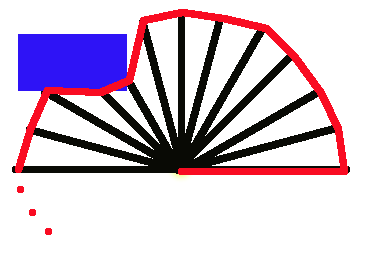 If it does intersect this line, limit the length of the ray to the value of the distance from the point of light to the point of intersection. 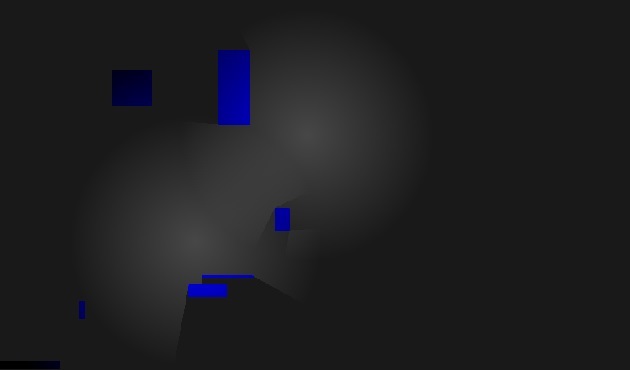 Now, obviously if we tell OpenGL to draw only at these rays we’re going to end up with something that looks like a sea urchin rather than a source of light. So, we solve this by using the GL_TRIANGLE_FAN mode. Assuming the first vertex you specify is the location of the light source, you then specify all of the intersection points we figured out above as the following vertices. That way, we fill in the space between the rays with our light, while excluding the area behind the objects! The red line represents the shape that OpenGL will draw as we specify all the vertices. Obviously with more rays, we’ll get a better result that doesn’t overlap the objects we’re trying to draw shadows around, but you get the idea from the picture (hopefully). So now we know what to do, how do we do it? I’ll post the source code as we go along. First, we need to define some basic classes which will help us keep track of everything. It is reasonable to make a Rectangle class, because we’re using rectangles frequently. We’ll give it a position, a width and a height, for now. We’ll also want a way to draw the rectangles easily, so we’ll add a public function for that too. 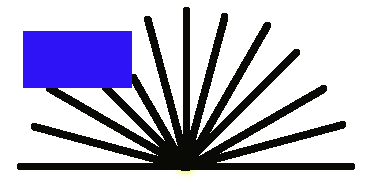 The RenRectangle class (odd name so as not to conflict with Windows Drawing Rectangle class) has a position, specified with a Point object. This is a basic class, again, which simply holds an X and a Y value. The Vector2 class has some operator overrides, which simply let us do things like multiplication of a float by a vector, for example. Very handy! If you haven’t studied vectors, you should look into those before continuing. At this point we’ll lose you if you don’t understand the basics of vectors! Right, the fun stuff. We need some vector maths. So, we want to find out where the vector of the ray meets the vector of the line of a rectangle, and we want to do that for ALL lines of ALL rectangles for ALL rays of light (0-360). S is the starting point of our line, D is the unit direction vector of the line. Still with me? Great! Now we just put all that we’ve said above in code. It simply stores information about the distance and if the lines do indeed intersect. So, on to the fun part: the light class. Here we simply define a constructor, some properties of the light, and a few useful functions we'll use later. Should be fairly straightforward. At this point is it important to note the variable t. Recall from above, t is the distance (magnitude) of the vector from the origin of the light to the intersect of the ray of light with the 'boundary' line of a rectangle (see fig. 2 above) which, if it doesn't intersect anything, is simply the max size of the light. So we set t = size, to start with, but t may change if we later find out the ray intersects with a boundary of a rectangle. So, how do we find that out? Well, we already did the maths above, we simply check all the boundaries (lines) of all our rectangles to see if they intersect with this particular ray! The alphascale simply gives that 'fade out' effect, so that as the ray extends, the light looks more diffused. After building the vectors we defined in the maths bit beforehand, we use our formula, then define the 'intersect' vector, which is finally the point of interception! Now we must ensure the point of intersection lies on the line (because it's possible that it doesn't, because the vectors go on for infinity) so we simply use our HitTestBound function to check that the intercept lies within the (very thin) box that is the line of the rectangle. If it lies in this box, it lies on the line of the rectangle, and thus it intercepts at this point. We return an Intercept structure (for future flexibility) with the new value of tR, which was what we set out to find. So now we have that, it's time to put it to good use. And there you have it, you should be able to piece the rest of it together if you've a bit of experience with OpenGL and OpenTK. It simply involves taking care of viewports and setting up the screens, but that's out of the realm of this tutorial, and can be found with a quick google search! Extend functionality by making a list of lights, and rendering each light in a foreach loop, as we did with the rectangles.